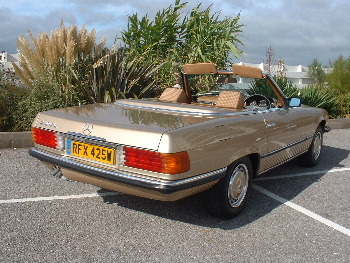 MERCEDES 380SL V8 1981-W 14,000miles! 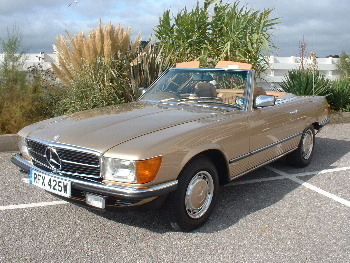 Finished in Champagne Gold Metallic with matching Cloth Trim,Hard and Soft Tops,CD/Radio Electric Aerial,Electric Windows,Central Locking,Power Steering,Automatic Transmission,Ex Channel Islands Car Hence Ultra Low Miles,We have personally researched the Car and Warrant the Mileage as True and Correct,This can also be replicated Visually,Supplied with New Service and Handbooks,An Original sales brochure,New MOT and a Full Service Prior to Collection or Delivery.Previousley sold by ourselves at 13,000 miles ! PROMISE NO DISAPPOINTMENTS.